How to calculate distance using Google API? In this article, I am going to explain about how to calculate distance between origin and destination place using Google API . This code snippet is be used in travel related websites. In most cases we need to calculate distance between two places when going to tour etc. 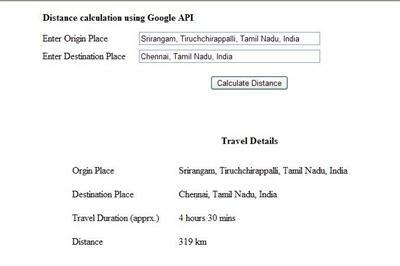 Using Google API we can calculate distance easily. I have explained here in detail with all code details and auto complete extender place name etc. I have placed two textboxes to collect orgin and destination place name from user. Using that two names calculate distance. In the server side I pass the origin and destination places to Google API and get back xml return data. From that return data I get that distance and approximate travel hours etc. I hope this code snippet is helping you to calculate distance between two places. This project nice.But this will be paid version or free version. Because I want this project sir. Brilliant article - saved me hours! Many thanks. It is free version i am using google api. I am getting this error..Please help me..Its urgent..I have to deliver it by EOD today. The remote server returned an error: (407) Proxy Authentication Required.” is appeared. How does it calculate the time . Thank You very Much, Very helpful suggestion. is there any way i can do that? calculates distance only 2500 time in 24 hrs and It expires after limit and shows error msg like "your daily quota API has Exeeded". And after that it doesn't calculate distance between Location.